Lately I have been wondering which is crazier, my decision several years ago to bicycle across America in my first year of marriage, or the plan my husband and I have hatched to drive his 2012 Nissan Leaf from Silicon Valley to Malibu. That’s 365 miles. It’s an easy day drive for anyone cruising in a traditional car, hybrid or Tesla. But his Leaf cannot make even 100 miles on a single charge. Still, there’s no turning back now. The Malibu hotel reservations are made, and soon we will depart from San Jose after work on a weekday evening, chug along to Salinas, the home of John Steinbeck, whose writings coincidentally inspired our bicycle trip. But it is practicality, not sentimentality which is bringing us to to Salinas. There is a charging station there, and after 60 miles of traveling, we will need one before we turn in for the night. Traveling only 60 miles on the first night of a trip? It’s unheard of right? Not when you have an EV. Then, it is up early the next morning so that we can make it 194.4 miles to the quirky, Danish-inspired village of Solvang, California. (If you saw the movie “Sideways” you saw Solvang). If any of you are doing the math at this point you will know that on this day, we will drive for about four hours and charge the car for close to seven hours, spread over two stops. Through his ChargePoint app, my husband has been keeping his eye on one of the crucial chargers we will need along the way, and every day, it has been available. We are keeping our fingers crossed that it will be vacant when we arrive. Then, we will need to find a way to kill three hours while the Leaf charges. Blogging about our adventures (and misadventures) will occupy some of the time, but three hours is a long time to do nothing. We were unable to find any super chargers along the way. There are only about 386 of these DC Quick Charging Stations in the nation. The only ones in between San Jose and Malibu are those specifically designed for Tesla Motors vehicles. These super chargers would reduce our charging time to less than 30 minutes, but the Tesla ones are not compatible with my husband’s 2012 Nissan Leaf. Our destination in Malibu has not one, but two chargers, and the inn owner drives a Chevy Volt. Now, that is our kind of place. We are spending two nights there so we can relax and rest up for the trip home, which honestly, we haven’t quite figured out yet. This beats the challenges of planning a bike trip, and we will be able to beat our 44 miles a day average for that trip. When we pedaled 4,697 miles across America in the 90’s, we actually used paper maps and had to cut out the names of motels and tape them on pieces of paper and pack them in panniers. Now, we just search for the charging stations through Blink Network or ChargePoint apps, plot them on Google maps, and click to find the accommodations nearby. Nevertheless, what traditional driver needs to spend an entire evening creating a spreadsheet for 365-mile road trip? That is what we have done, mapping out charging stations, and our backup, fellow EV drivers who are part of PlugShare, and allow others to come to their home to charge an electric vehicle. A total of 4,785 chargers of the 20,138 chargers in the nation listed by PlugShare are home charges which EV drivers open to others. We are hoping we will not need to do that, but if there is one thing I learned about out bicycle trek, it is to expect the unexpected, and never underestimate the kindness of strangers. We are hoping for both as we take on the EV ride of our lifetime- or perhaps the first of many. 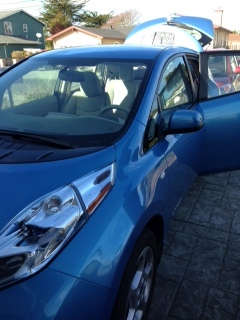 Come along for the ride, and see how well our EV and our marriage survives a road trip from Silicon Valley to Malibu. And, wish us luck! I wish you luck, but I also wish your pieces didn’t frequently have a tinge of negativity, doubt &or fear associated with them, and make owning and operating the car sound like a burden. Sorry to say that 😐 but even your question here about “What fun would that be?” sounds a bit rhetorical &or sarcastic. Instead, I think you could/should look at it all as an adventure, full of new experiences to be savored — regardless of their challenges or outcomes, and look at yourselves as the pioneers that all of us early-LEAF-adopters are. Yes, it would be nice if I-5 had a super-charger at every exit and hopefully that day will come soon. It would also be nice if Tesla and Nissan agreed on which standard was best so that they could be shared, but perhaps that riddle will be solved in the long run as well. I hope that you enjoy your trip (with a refreshed attitude), I hope your marriage is strengthened (?! ), and I hope your reporting encourages Nissan, the state, and the standards people (for quick-charging, in all EV companies) to get their act together and make the west coast easily traversable by EVs of all stripes. Thanks for your comment. I have been assuming that people know that my comments about by marriage surviving are all tongue in cheek, and if it does not come across that our bike trip and this trip are adventures that I savor. I do , however , think that if EVs are too go mainstream, they will need to accommodate the average American who does not want driving to be a time consuming adventure. Going forward, I will try to make sure that my efforts at humor do not come across as too sarcastic. :) I hope you follow along. Sorry about the “marriage comment”, which may have distracted from my much larger theme — that owning and operating an EV *can* be looked at as a burden at times, but also as an adventure, an opportunity and learning experience (of all sorts). And perhaps it’s just me, but I feel like your otherwise entertaining, educational and enjoyable posts skew toward the former. But I also realize that you’re not an advocate, per se, but rather a journalist trying to give both sides of the experience. So I apologize for that mistake, and for my indelicate criticism. “That being said”, I’m pretty confident that all EV makers and even potential buyers know full well, and are working hard on what is needed for the vehicles to become mainstream. Or at least they should (be), and I surely hope they are! Best of luck! Should be a nice adventure, and no gas will be burned in the process. In Deborah’s defense, a car that requires two hours of refueling for every hour of driving is a deeply impractical vehicle compared to a conventional automobile, which gives you seven hours of driving for 15 minutes of refueling. Imagine an all-electric taxi fleet: you would have to have three times as many cars to keep them running around the clock like a standard taxi fleet. Having said this: the vast majority of American cars sit for many, many more hours than they run, so for short trips in town, an electric is a very practical alternative. The drive Deborah and her Mike are attempting is completely unsuited to a car with such a short range, and that’s precisely the point of the experiment. Often the greatest discoveries happen when products are used in impractical or unexpected ways. For instance, forcing the driver to enjoy two hours of leisure for every hour of driving could create a whole new category of short-trip tourism. In any case with outside-the-mainstream products you have to address the negatives; otherwise you invite a backlash. « Am I too negative about #EV driving or just a realist?